Now...mid to late June It's important to continue the pest managment and wind protection as earlier this month. 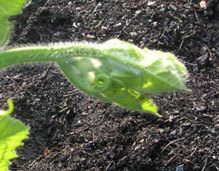 The plants should be vining well by now and you attention should turn to pumpkin husbandry. Soon it will be time for pollination so it is important to train the vines as they grow. In anticipation of the flowers and pollination you should not add nitrigen fertilizer now. Male flowers will be the first to arrive with the females following a week or more later.. Flower identification is key. Even at the earliest stage you can see the difference. Female flowers have short stems and always have tiny pumpkins under them as seen in the left picture above. 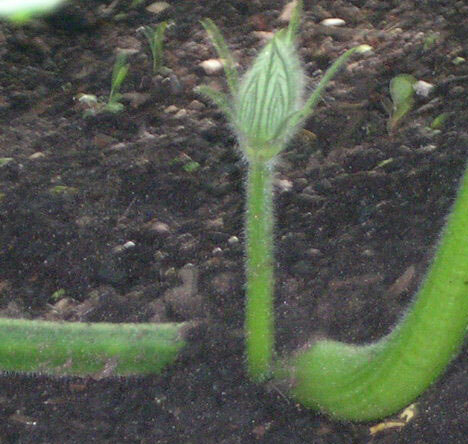 As they develop it becomes easier to see the tiny pumpkin(right picture). 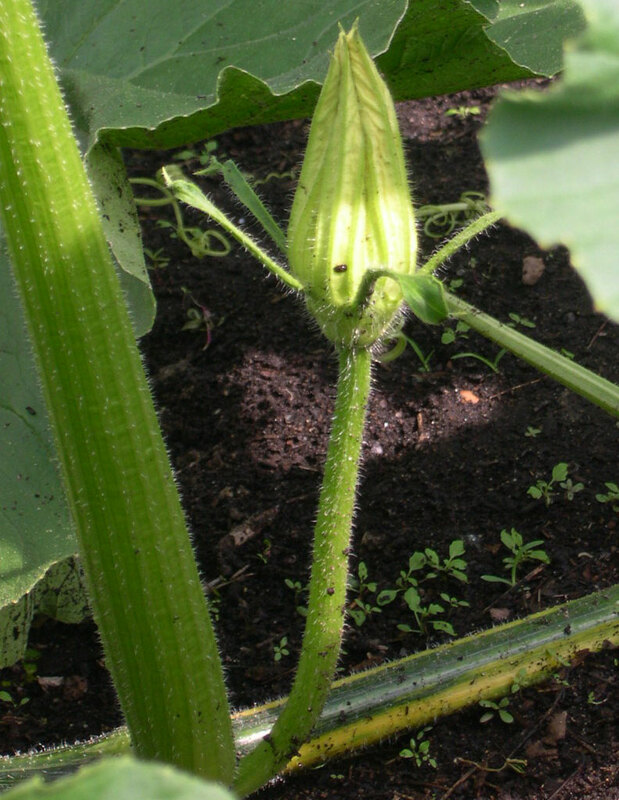 Male flowers always have long stems without little pumpkins below. These 2 pictures show male flowers at the earliest stage and later as the stem gets more pronounced. Both female and male flowers will grow dramatically and the orange color inside will become obvious the evening before they will open the next morning as seen in the pictures below. IT TAKES ONE OF EACH TO MAKE A PUMPKIN !!! PEST CONTROL .....cucumber beetles continue to be a pest we don't want. Sevin is cheap, readily available and effective. 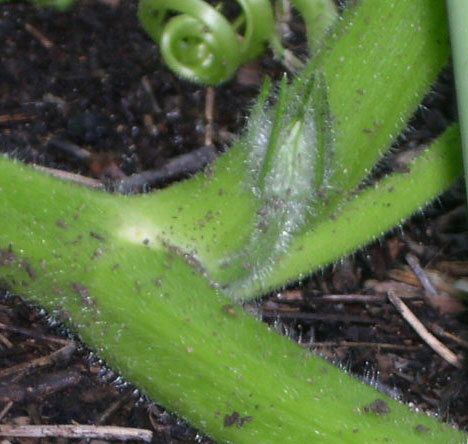 The othe big insect pest is the Squash Vine Bore. It's a moth but looks like a wasp. They are black with 3 red spots on its back. Being fast moving they are hard to get close to. The easiest pesticide for you to get for them is Triazicide which is usually available at places like Lowes. ALWAYS READ THE LABEL AND FOLLOW DIRECTIONS. For organic controls the current rage is garlic barrier . It has a very strong smell and bugs don't like it. You can try a 'google' search to find it. Wind protection ...Continue the wind protection for as long as possible. Now that the vines are running it's important to protect and stabilize them so they don't become rolled by the wind..
Vine TRAINING and PRUNING... Now that the main vine has landed and side vines are growing your attention should be directed to training and pruning. use the bamboo stakes to guide the side vines (secondaries) so they grow at right angles to the main vine. Remove any little vines that originate from the secondaries. As the plant growes it will become christmas tree shaped. Let the secondaries grow out to the edge of the patch or about 10 to 12 feet and then terminate the vine growth. Watch the main vine for female flowers. When you see one out at least 10 feet it is a candidate for pollination so you should train the main vine in an "S" curve to orient the female flower on the outside of the curve. Never try to bend the vine to much or to sharply. These changes are best done a little at a time in the hottest part of the day. Pollination.....It's time to start thinking about pollination. Sure you can let the bees do their thing but there are good reasons to give nature a helping hand. 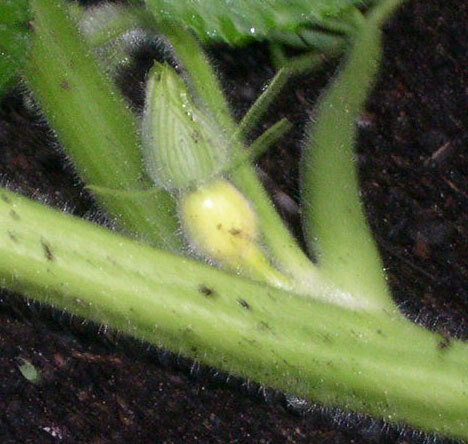 If the pollination is incomplete the little pumpkin will abort and be gone. Bees are in short supply in many areas so our pumpkins need all the help we can give them. Giant pumpkins don't happen by accedent. Growers have spent years making selective pollinations to improve the seeds so we can get bigger and better pumpkins. To do this we need to protect the flowers from pollin stealing bees and other insects. The evening before the flowers will open its important to cover both the male and female flowers. Then in the morning we can cut the male flowers and use them as a brush to gently transfere the pollin to the female flower. 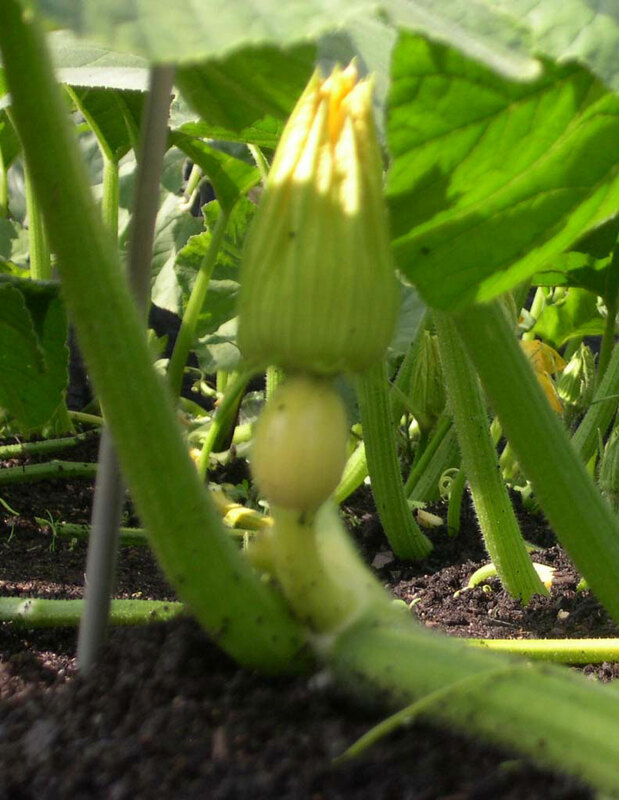 After the pollination is done recover the female flower for 24 hours to protect your pollination. Female flowers are only receptive in the morning for a few hours on the day they open. The same is true for the pollin in the male flowers. Paper lunch bags, netting, and dixie cups have all been used to cover and protect the flowers. Bees are attracted to the flowers by the color so keep them hidden. If it is very hot you will need to provide some shade for the females on the day of pollination and perhaps a few days after as well. watering/misting.....when the temperatures are very hot and the plant is young, the plants will have a hard time keeping their leaves up and not wilting. Small plants will not have enough root structure to keep up. Be sure you provide them with enough water. Misting the plants during the hottest part of the days will help to cool them a bit so they are less likely to wilt. Even if you just spray them with the hose it will help.